A flowery email invitation may easily capture a reader’s attention but may not answer some questions from the prospect. 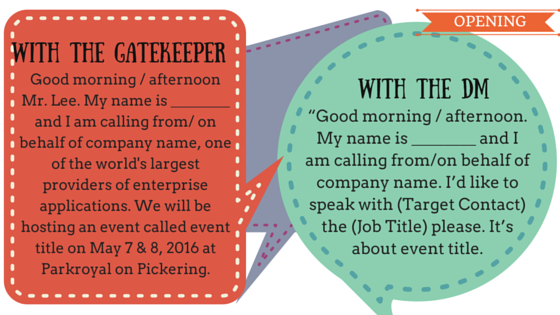 The Opening spiel is an identification of who you are, the company you represent and the purpose of the call. It must include a warmth greeting and and a brief branding of the product or service. Normally, gatekeepers would answer the initial call so you have to keep a pleasant tone to get through. “Good morning / afternoon. My name is ________ and I am calling from/on behalf of company name . I’d like to speak with (Target Contact) the (Job Title) please. It’s about event title. Once you have reached the DM and have delivered the Opening spiel, you may proceed to the Body of the script and comprehensively explain the full event details. Keep in mind that most prospects may only have more or less 5 minutes to spare for the call, so organize your spiels and customize your answers according to the prospect’s questions/responses. Learn how to stand out in trade shows from thousands of IT and software companies in Singapore! If the answer is yes, confirm if he was able to register online. Most email invites now contain online registration links. If the answer is yes, proceed to verify contact details:Com pany Name, Contact Name, Job Title, Phone Number (Direct Line/Mobile). Jet down everything. If no, suggest to register the prospect online on his behalf. 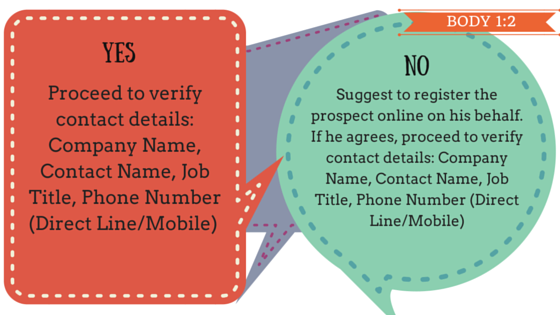 If he agrees, proceed to verify contact details: Company Name, Contact Name, Job Title, Phone Number (Direct Line/Mobile). Immediately verify his email address and resend the invite while you still have him on the call. This will open the opportunity for you to get him registered for the event and save both yours and his time from calling back. Ask the prospect if you could possibly extend the invitation to his colleagues. If he agrees, note down the full name, job title, phone number, email address. Get in touch with the colleague as soon as the invite has been sent. “Mr. Lee, you are already registered to the Flavours 2016 event, which will happen on May 7 & 8, 2016 at the Parkroyal on Pickering. Attendance registration starts at 8am until 9am. If you’re not yet convinceD, you should read ‘Why an Event Telemarketing Campaign Will Work For Your Business‘. These are helpful information like event details : title, date, time, and venue, the company’s website link or event link, and WIIFM (what’s in it for me) insights for prospects when they attend the event. 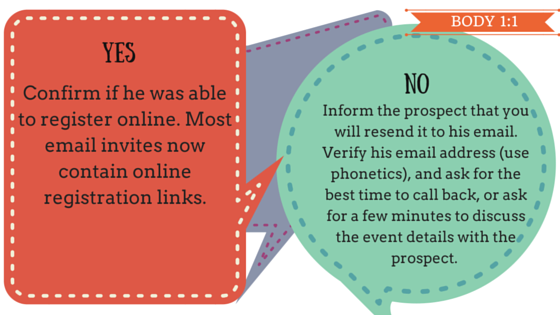 Event telemarketing emails contain flashy highfalutin words to grab a reader’s attention and perk up excitement. But not for an event telemarketing script where all you need is just to include all the important event details and some creative workarounds like quick tips and reminders – concise, complete and comprehensive – to make it the best. Meanwhile we converted this into slides, check out this humorous and interactive slideshare. Enjoy! Are you getting a hard time on making your event a big hit? You might want to tap our event marketing services.Get new Singapore customers for your business. Callbox Shares Lead Qualification Secrets in Singapore Through Answering 4Ws... Expanding Business in Asia – How Do Multinational Companies Do It?